Terraco ICF Zenith uses inter locking expanded polystyrene blocks as insulated concrete formwork (ICF) as the insulation material. The Insulated Concrete Form (ICF) construction systems have proved popular in the United States, Europe and the Middle East for many years. These systems reduce construction times, have good insulation properties, and reduce energy consumption in hot and cold climates. ICF systems use interlocked expanded polystyrene "blocks" as an insulated concrete formwork (ICF) for rapid construction of structural walls while also providing continuous insulation for both the exterior and interior walls. Internally: Terraco Handycoat Interior skim coat overcoated with one of Terraco's Interior Paints or Decorative Architectural Coatings. As the decorative finish is of paramount importance to architects and interior designers, they are able to select textures and colours to meet their architectural requirements from Terraco's extensive range of exterior decorative wall coatings, as well as from the Terraco Interior Paint Range and Designer Collection Interior Range. Terraco Styrobond DP HB A specially formulated embedding mortar to embed Terramesh glass fibre reinforcing mesh in ICF construction where a high build basecoat thickness is required. System Profiles A range of accessories required for strengthening and finishing the system around window and door openings, window sills etc. Primer A basecoat substrate penetrating primer – P Primer. Decorative Finish A high performance, decorative Terracoat acrylic or silicone wall coating which is sometimes finished with a clear or pigmented top coat. Terraco Styrobond DP HB A specially formulated embedding mortar to embed Terramesh glass fibre reinforcing mesh in ICF construction where a higher thickness is required. System Profiles A range of accessories required for strengthening and finishing the system around window and door openings, window sills, etc. Skim coat Skim walls with two coats of Handycoat Interior to create a surface suitable for painting and decorating. Decorative Finish Terraco offers a range of quality interior paints, designer collection coatings for finishing the interior walls and ceilings. 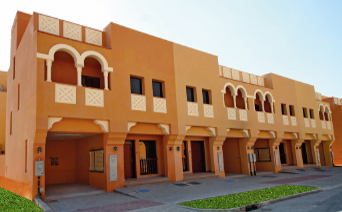 A prime example of Terraco ICF Zenith is Hydra Village, Abu Dhabi, United Arab Emirates where over 600 multi-story homes were constructed using this system, making it the largest example of successful ICF construction in the Emirates.